Scrubbers are air-pollution-control devices that remove harmful gases and particulates from the smokestacks of incinerators, chemical manufacturing facilities, and electric power plants before they enter the atmosphere. There are different types of scrubbers, including wet and dry, regenerative and nonregenerative. Regenerative scrubbers recycle the material that extracts the pollutants. The nonregenerative wet scrubber is most commonly used to capture sulfur dioxide emitted from coal and oil burning power plants. It works by spraying limestone and water slurry into the flue gases. Sulfur dioxide reacts with limestone to form gypsum or calcium sulfate. The gypsum sludge is disposed of in landfills or recycled in saleable byproducts such as wallboard, concrete, and fertilizer. Regenerative scrubbers can also be used; one reacts sodium sulfite with sulfur dioxide to form sodium bisulfite, from which sodium sulfite is recovered by adding alkali. The released sulfur is trapped in water to produce sulfuric acid, which is sold to offset the cost of installing the scrubber. Particulates can be removed using venturi and centrifugal or condensation scrubbers. Flue gas enters through the top of the cone-shaped venturi scrubber and water, injected horizontally, forms droplets that absorb dust and other particles. 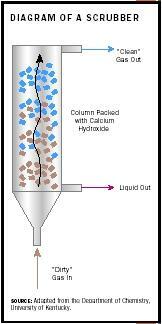 The resulting slurry discharges from the bottom of the unit or can be separated from the clean gas by centrifugation or spinning at high speed. Copper oxide regenerable scrubbers that absorb sulfur and simultaneously convert nitrogen oxides to nitrogen are being researched. In 1971 the EPA set a maximum limit on sulfur dioxide in air. To help meet this limit, revisions to the Clean Air Act in 1977 required all new power plants to install scrubbers to remove sulfur dioxide. Most spray tower scrubbers remove at least 90 percent of sulfur dioxide, according to the EPA. In 1990 further revisions to the Clean Air Act under the Acid Rain Program allotted allowable amounts of sulfur dioxide emissions to electric utilities, which could trade allowances to meet their quotas. Sulfur dioxide emissions from power plants in 2001 were 33 percent lower than in 1990 and 5 percent lower than in 2000 according to the EPA. SEE ALSO A IR P OLLUTION ; C LEAN A IR A CT .
Schnelle, Karl B. Jr., and Brown, Charles A. (2002). Air Pollution Control Technology Handbook. Boca Raton, FL: CRC Press. Adapted from the Department of Chemistry, University of Kentucky. EPA Air Pollution Technology Fact Sheets. "Condensation Scrubbers" and "Spray-Chamber/Spray-Tower Wet Scrubber." Available from http://www.epa.gov/ttn . Illinois Clean Coal Institute Annual Report (2002). Available from http://www.icci.org .